Head to Double Door (1572 N. Milwaukee Ave.) tonight to see four great Chicago-based indie bands playing for a good cause! 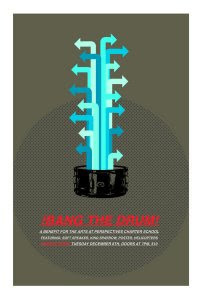 Helicopters (reviewed here), Soft Speaker, King Sparrow (free download here) and a new band, Poster, will make up the bill for the show, dubbed "Bang the Drum," to benefit the Arts at the Perspectives Charter School. The Arts program at the school has been affected as a result of budget tightening, and the bands are helping to fix problem by donating proceeds to the purchase of musical instruments and art materials. -Doors 7 p.m., show 8 p.m.